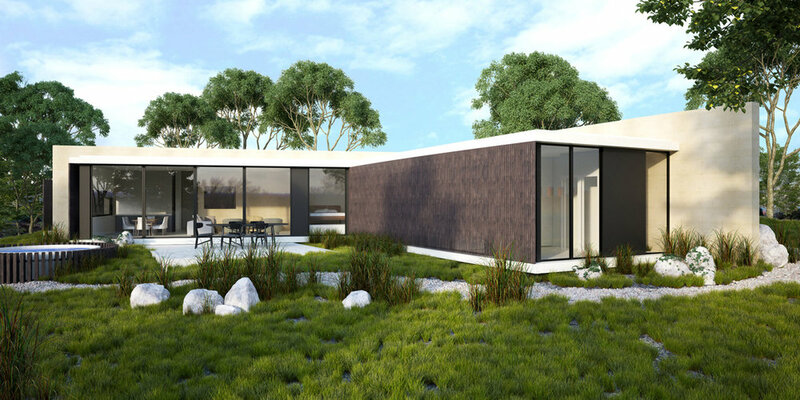 This new sustainable green roof home design will be located in the pioneering eco residential community of Mullum Creek in Melbourne’s leafy Donvale. Homes designed for Mullum Creek are required to adhere to Ecologically Sustainable Development (ESD) principles including home energy efficiency and solar power, water conservation, sustainable building materials, and best-practice construction techniques. Our concept for the home features an earth covered roof, also known as a green roof, to navigate the sloping site. This green roof will not only provide the home with outstanding insulation to reduce heat loss and energy consumption, the living roof by landscape architect Jo Henry will also private privacy from the adjoining property and blend the home in beautifully with its surroundings. The home also features rammed earth spine walls for thermal performance and aesthetic appeal, high efficiency thermal break windows, solar power, solar hot water system, Passivhaus design principles and prefabricated wall and roof systems. It has a small plunge pool, gym and a small cellar. This project is due to be completed in early 2018.